Welcome to the home of The Silurian Border Morrismen on the web. Within these pages you can find all manner of information related to The Silurian Border Morrismen and their activities. For those of you who haven't seen us, the Silurian Border Morris Men are from Ledbury, Herefordshire. 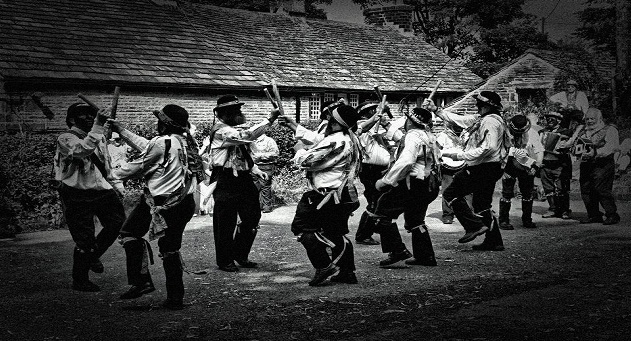 We perform traditional dances collected from towns and villages on the borders of England and Wales in the counties of Herefordshire, Worcestershire and Shropshire. Our dances were collected by the late Dave Jones, founder member of the side, during the 1960's and 70's from historical records and first hand accounts of the dances from some of the surviving Welsh Border Morrismen who had performed the dances in the 1920's. Today we still perform this original repetoire of dances.